The Donald Sterling controversy was always either going to overshadow and quiet the debate over the Redskins' team name, or bring it to the forefront. Well, here's the answer: A whopping 50 U.S. senators have signed a letter to Roger Goodell, a letter that minces no words: "It's time for the NFL to endorse a name change for the Washington, D.C. football team." "The despicable comments made by Mr. Sterling have opened up a national conversation about race relations. 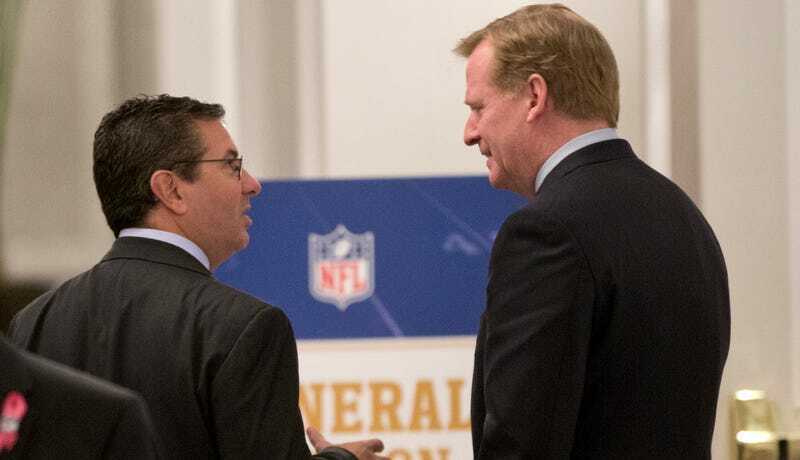 We believe this conversation is an opportunity for the NFL to take action to remove the racial slur from the name of one of its marquee franchises." "Listen, it is hard to get 50 people in this place to agree on anything," said Maria Cantwell (Wash.), who circulated the letter. But there's not really anything resembling consensus here. All 50 senators who signed are Democrats; it wasn't even circulated among Republicans. This is now an unavoidably partisan issue, and on those, not much tends to actually happen in Washington—be it on Capitol Hill or in Landover. "The intent of the team's name has always been to present a strong, positive and respectful image. The name is not used by the team or the N.F.L. in any other context, though we respect those that view it differently." I agree with Florio's take on this response (I know, I hate myself too). This is previously unceded ground being now treaded by the league: An admission that those offended by the name "Redskins" deserve respect for their viewpoint. And if you're going to acknowledge that taking offense is a legitimate reaction—if not a universal one—doesn't that imply that the controversial name might be legitimately offensive?